A verifiable halt to further production and deployment of intermediate- and intercontinental-range missiles is worth seeking. Such a halt may be more negotiable than is commonly believed if the North faces limits on the number of powerful missile engines it acquired from Russia and Ukraine in the immediate aftermath of the breakup of the Soviet Union. While North Korea has developed most components of its missile and nuclear arsenal indigenously, some experts like Michael Elleman and Markus Schiller doubt that it has managed to manufacture engines for longer-range missiles on its own. A production halt might be verifiable by satellite reconnaissance or sensors placed near plant facilities. Although the number of final assembly sites is low, many more plants—not all of them at known locations—contribute to missile production, making remote monitoring by national technical means somewhat problematic. Ideally, Kim’s apparent willingness to entertain on-site inspections at Yongbyon will eventually be extended to missile production sites. Portal and perimeter monitoring at such sites, analogous to that under the INF and START treaties, might enable on-site observers to distinguish production of shorter-range missiles, which could still be produced, from their longer-range brethren, which could not. A halt to deployment of mobile missiles presents difficulties of its own. On-site inspections like those spelled out in START Annexes 2 and 3 would be the preferred way to monitor deployments, but such arrangements may prove difficult and time-consuming to negotiate. An interim solution that relies on cooperative measures may be possible. When the possibility of limiting intermediate-range Soviet forces was first examined within the US government in 1979-1980, it was considered both doubtful that the Soviet Union would agree to eliminate their newly deployed SS-20s and undesirable, at least by some, that the United States would abandon deployments of Pershing and cruise missiles altogether. Instead, it was assumed that numerical ceilings would be negotiated. It was also assumed that the Soviets would not agree to on-site inspection. The SS-20s—unlike North Korean longer-range missiles—were all solid-fueled, making them much easier to move than liquid-fueled missiles which needed to be accompanied by fuel trucks and fueled in the field, limiting their mobility. Yet mobile missiles were best thought of as movable, like a house, on paved or at worst unpaved roads, but off-road mobility was thought to be limited because it risked damaging the missiles. Moreover, they could not range far afield, but were tethered to main operating bases. These bases were sufficiently distant from one another that the missiles could not be quickly transported from one base to another. To monitor the number of deployed missiles under such assumptions, a scheme was developed to take advantage of the standard operating practices of Soviet missile units. At various intervals, a base would be open to overhead reconnaissance. All the missiles would be required to return to base, be deployed outside their garages or caserns, and leave their sliding roof garages open for several days to allow satellites to count the missiles. Because the missiles on display would be more vulnerable to attack, such “parades” would be held at one base at a time. Missiles at other bases would be free to roam to avoid jeopardizing the entire force to a knockout blow. The scheme did not cover non-deployed missiles, which in theory could be reloaded onto heavy trucks, called transporter-erector-launchers or TELs, and fired after the first missile volley was launched. While reloads could not be counted and monitored in this scheme, the threat that more than a few reloads could be launched was considered unlikely. The idea of parades was overtaken by events when the Soviets agreed to a ban with an on-site inspection. Nevertheless, could this parade scheme be applied to monitoring a halt to the deployment of North Korean missiles? That depends on satisfying several key conditions. The missiles would have to be tethered to main operating bases and the bases would have to be sufficiently far apart to reduce the chances that the missiles would be relocated. North Korean missiles secured off-base might be more detectable than the SS-20s were because they would likely be accompanied by fuel trucks and other companion vehicles. Any movement might give off telltale infrared signals. One difficulty in the North Korean case is that longer-range missiles might be co-located with shorter-range ones, although it may be possible for high-resolution cameras to distinguish them. Would such a scheme be practical in the interim before more permanent on-site arrangements can be negotiated? It is worth further study—but only if the United States is willing to accept “corresponding measures,” such as North Korean overflights of US bases in South Korea analogous to those permitted under the Open Skies Treaty in Europe. As with all verification measures, a willingness to satisfy some of the North’s political objectives will be critically important for success. 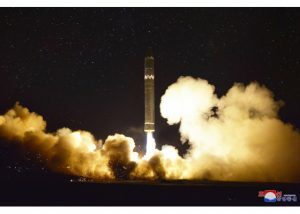 Michael Elleman, “The Secret to North Korea’s ICBM Success,” Survival, 59, no. 5 (2017): 25-36, https://doi.org/10.1080/00396338.2017.1375218; and Markus Schiller and Robert H. Schmucker, “Flashback to the Past: North Korea’s ‘New’ Extended-Range Scud,” 38 North, November 8, 2016, https://www.38north.org/wp-content/uploads/2016/11/Scud-ER-110816_Schiller_Schmucker.pdf.